Ordinary people. Extraordinary stories. Listen to history's unsung heroes who changed the world, in this powerful documentary series. Get closer to events you may only have heard about from school books with these first person accounts of key moments in recent world history. In each episode we explore pertinent dates from 1936 to 2010 and find out what happened through the eyes of those who were there. Crossing the globe and drawing on events in London, Mexico City and Afghanistan to name but a few we hear stories including takes from an athlete, journalist, chess player and soldier. 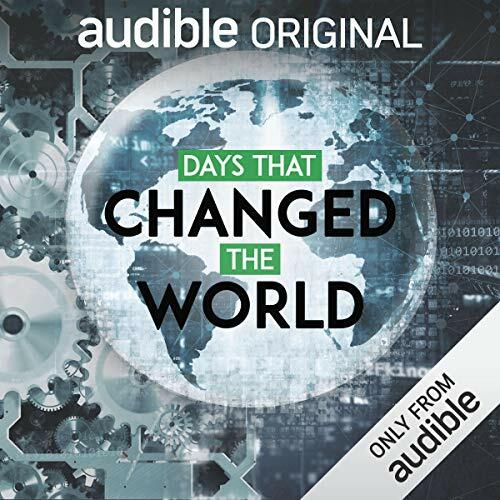 As an Audio Show - free for members - when you add Days that Changed the World to your library, you'll get all 11 episodes, each with a runtime of about 25 minutes. Good topics, but it's hard to assess the writing, structure and conclusions when the special effects/music are set so loud they obscure the words. Not for people with any kind of auditory issues. This takes history that you may or may not know about and puts it on a personal level, interviewing people who actually lived it. The only compliant I have is the sound design. On some of the episodes, I REALLY hated the sound effects that were super loud. RIP headphone users. Don't waste your time unless you like to hear short stories from a very leftist perspective. I normally listen to fiction only but this is so worth it! Absolutly fascinating stories! Very informative and enjoyable! I learnt a great deal about the world in a relatively short time. Great for short commutes to work. Great insight into significant events in the past. A must listen. Loved it.Great insight into significant events in the past. The Chernobyl episode was harrowing. Nice freebie with some fascinating facts and stories I'd not heard about. Enjoyed this short series between some bigger "reads". interesting moments of history, some known but only superficially, some will be surprising to you! very informative, perfect for short car journeys when bored of the same old songs on the radio. A professional job. Great to listen to. It’s great listening. Very professionally and skillfully put together. The use of sound and different narration and samples is great at feeding the imagination and helps immerse you in the story of each episode. Great work. Highly recommend it. A highly informative series of things that are not taught in mainstream education that many will have missed or never known about. Well read with information from those that saw it with their own eyes. I was amazed that there were some things that people did and got away with. A great series for all ages that I would very much recommend getting. This is a great collection, wonderfully narrated. I sure hope there's more where this came from! This is free and you can tell. informally expect great quality from audible but this disappoints. You could probably get a more informed perspective on Wikipedia the stories are very shallow and not really stuff I didn't already know.